In June 2018, British Columbia’s Ministry of Environment and Climate Change Strategy completed a review of professional reliance in the natural resource sector to ensure the highest professional, technical and ethical standards are being applied to resource management in British Columbia. Professional reliance takes different forms across the natural resources sector, but in general terms is a regulatory model in which government sets the natural resource management objectives or results to be achieved, and professionals hired by proponents decide how those objectives or results will be met. Generally, government oversight focuses on monitoring, compliance and enforcement, rather than reviewing and approving plans or project designs. In doing so, government relies on the professionalism of the qualified professionals (QPs), the professional and ethical codes they are required to follow, and oversight by the professional associations to which they belong. The professional reliance review was led by Mark Haddock, seconded from the British Columbia Forest Practices Board to author the report. The review included a public engagement, which received over 2,200 feedback forms from the public, 102 stakeholder submissions and over 1,800 surveys from qualified professionals. “In 2001 and 2002 the provincial government conducted a core services review, which involved a major effort to reduce regulations in the natural resource sector, reduce the size of government, and shift towards results-based regulation. As part of this effort, and in some cases integral to it, a system of professional reliance was also introduced,” explained Mark Haddock in his Executive Summary. “Over the last several years, examples have been raised by the Ombudsperson, the Forest Practices Board, and the Auditor General that highlight significant gaps in professional reliance models of regulation. “The result of my review produced two major recommendations concerning professional governance that will serve to strengthen and bring best practices to the professions whose expertise is needed for sound management in British Columbia’s natural resource sector,” continued Mark Haddock. “First, that government establish an Office of Professional Regulation and Oversight that would have authority similar to that found in the Health Professions Act. The Office would be an agent of government, independent from the natural resource sector ministries, and focused on professional governance issues. Ultimately, the intent of the Office would be to oversee professional legislation, develop best practices for governance, and regulate professional organizations as needed. Download a a copy of the Professional Reliance Review. 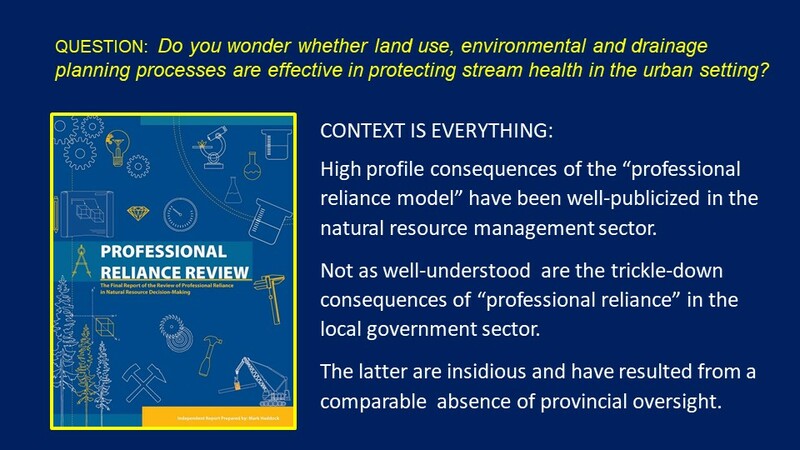 High profile consequences of the “professional reliance model” have been well-publicized in the natural resource management sector. Not as well-understood are the trickle-down consequences of “professional reliance” in the local government sector. The latter are insidious and have resulted from a comparable absence of provincial oversight. In 2002, for example, the provincial government released Stormwater Planning: A Guidebook for British Columbia. This set a new direction for land development, founded on the principle of working with nature, to restore stream and watershed health. Yet, 16 years later, communities are experiencing more flooding and more stream erosion; and streams are going dry during extreme droughts. Why? 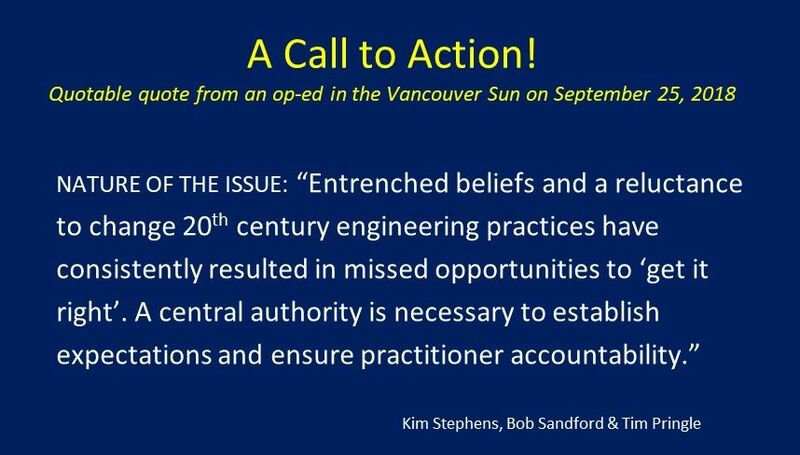 Entrenched beliefs and a reluctance to change 20th century engineering practices have consistently resulted in missed opportunities to “get it right” A central authority is necessary to establish expectations and ensure practitioner accountability. In the absence of a regulatory requirement, the process to adopt, change or evolve accepted practices is painfully slow. Reinvigoration of the provincial oversight function is essential to help local governments be effective in moving B.C. towards restorative land development. The good news is that – starting with “Living Water Smart, B.C’s Water Plan” in 2008 – a provincial policy, program and regulatory framework is in place to achieve this desired outcome. The not-so-good news is that policy and program effectiveness has been undermined over the past decade due to cutbacks in civil service capacity. With provincial commitment, the situation can be turned around.